Information Super Highway Roadster likens the experience of an internet search to spending hours in a library, researching one subject but being held up by countless unrelated books. 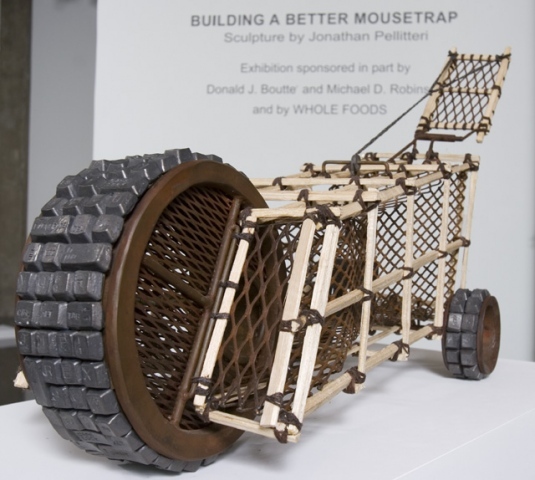 This sculpture uses an unconventional mousetrap design called the “Mouse Mobile”, as the basis for an investigation of the way I seem to become trapped on the internet, searching for one thing but finding myself consumed by countless other subjects. Lured into the roadster by the antiquated tactile experience of research that I am nostalgic for, the prey cannot escape, destined to roam the information super highway.